KNOXVILLE, TN, October 16, 2018 — Waves Audio, a leading provider of digital signal processing solutions, introduces the Waves Abbey Road TG Mastering Chain plugin. 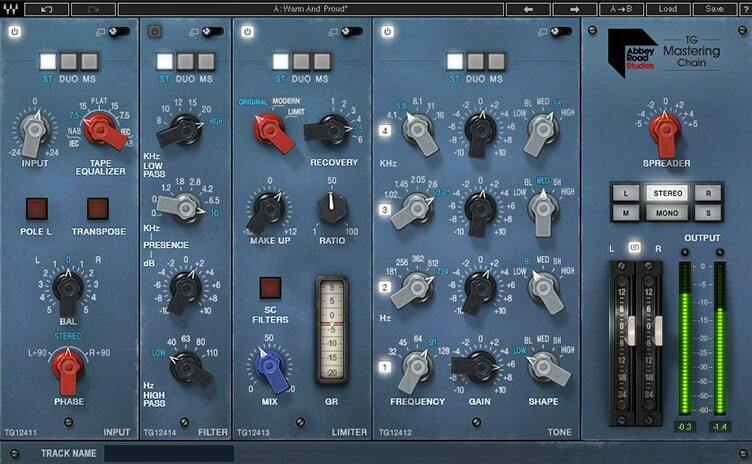 Developed together with Abbey Road Studios, the TG Mastering Chain plugin is a modular mastering chain plugin modeled after the EMI TG12410 Transfer Console used in all Abbey Road’s mastering suites since the early ’70s to this day. The distinct solid-state transistor-based sound of the TG12410 has proven itself time and again over many decades. Whether it is used for mastering as a complete console, or for mixing with only select modules, the TG brings nothing less than magic — the same magic heard on albums like Pink Floyd’s The Dark Side of the Moon, Nirvana’s In Utero, Radiohead’s OK Computer and Ed Sheeran’s + (“plus”). Thanks to this Waves/Abbey Road collaboration, the TG12410 is now available outside of Abbey Road Studios, allowing you to bring the very same magic to your own productions. TG12416A.L (Spread) Module (stereo component only) incorporated into the Output Module.